Whether you're afraid of heights or not, stepping on sky-high glass observation decks can induce vertigo or even terrifying, piss-your-freaking-pants experiences. And yet, a new attraction coming to the top of the U.S. Bank Tower this summer will literally take your fear to a new level with a glass slide suspended 1,000ft above Downtown LA. 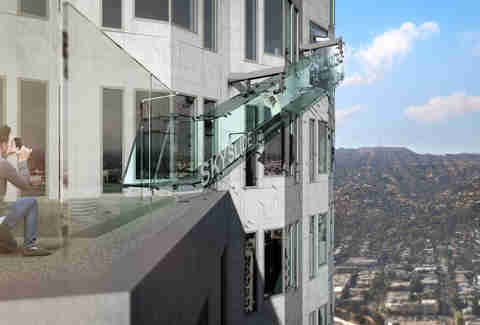 The giant glass chute, aptly dubbed "the Skyslide," will launch as part of the new, multi-level Skyspace LA observation center slated to open at the building on June 25th, along with an open-air observation deck. 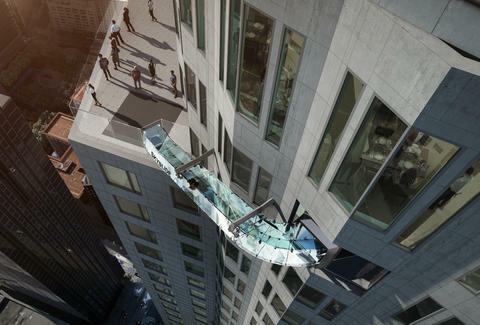 The slide is made with 1.25in-thick glass and will span 45ft from the tower's 70th floor to the 69th floor. Oh, and did we mention it'll be positioned 1,000ft above the ground? Just looking at the renderings will make your palms sweat. Sure, NYC's One World Observatory is perched atop the nation's tallest tower and The Ledge at Chicago's Willis Tower is certifiably scary as hell, but sliding high above the ground with nothing but a thin layer of glass beneath you will outdo them both. Although they'd probably have to pay you to even set foot near this thing, passes for the Skyslide will sell for $8 and will be available at timed intervals for perfectly streamlined screaming. Tickets to Skyspace LA are $25 and will go on sale beginning March 18th, ahead of the observatory's summer opening, according to a spokesperson. In the meantime, you can start building the courage to go, or uh, just try to burn this from your memory. Tony Merevick is Cities News Editor at Thrillist and thinks that if he can do the Ledge at Willis Tower in Chicago, he can do this, too. Send news tips to news@thrillist.com and follow him on Twitter @tonymerevick.